Manuscript (abbreviated MS; plural MSS) is derivative of the Latin manuscriptus , from manu (ablative of manus ), “by hand,” and scriptum , “written.” Scribere , “to write,” ultimately goes back to older forms meaning “to scratch,” which distinguishes this form of writing from engraving or impressing marks into stone or clay. Thus, etymologically manuscript implies only writing with pencil or ink and some form of paper (a scroll, loose pages, a codex), though its contemporary connotation allows that a manuscript may be handwritten, typed, or electronic. 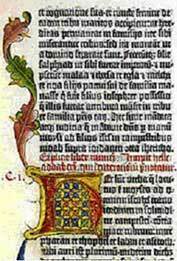 After the invention of the printing press circa 1450, manuscript began to take on a more restricted meaning. The manuscript became a text that had not (yet) been set in type –the author’s original handwritten copy of his or her work, as opposed to later or final reproductions of it. Though the OED does not explicitly draw the distinction, the modern connotation carries with it the implicit expectation that this handwritten material will be published. While in pre-print culture, the manuscript was an end in itself and each was a discrete object, this later definition marks the manuscript as the starting point of print production. After the invention of the typewriter (which began to be mass-produced in 1874), there were at least three distinguishable stages of manuscript . Typically an author would “pen” his work, creating a messy first manuscript. Joyce’s manuscripts, for example, are palimpsests of deletions and developments. From this initial manuscript, the author would usually produce a “fair copy”–written in a hand more legible to others, and containing fewer changes, marginalia, etc.–for a typist to reproduce with a typewriter. This “typescript” was then corrected, usually by hand, by the author and used in typesetting the work. [iii] From typesetting on, the manuscript was left behind, and production continued in galleys, proofs, etc. That is, once typeset the manuscript (which may have been a typescript) remained static, as it had before the invention of the typewriter. In studying written works, there is often a tension between manuscript and final product. That is, the manuscript (or even an older version of a manuscript) may shed light on new meanings or call certain interpretations of the text into question. In any case, comparing a manuscript of a work to the final version may ultimately undermine the stability and definitiveness of the final product. Two outstanding examples of how manuscript studies affect reception of a final product are Portrait of the Artist as a Young Man and Joyce’s earlier manuscript draft, Stephen Hero , and D. H. Lawrence’s Lady Chatterly’s Lover , which was published in several editions, each with different expurgations. In each case, the authority of the published text was shaken by later comparative investigation of the manuscript. Conversely, two further examples call into question the authority of the manuscript in relation to the final product: The First Man by Albert Camus and the “Criminals” section (Book II, Part III) of The Man without Qualities by Robert Musil, as published, were never edited by their authors in proofs. Would the authors have left these books as is, approving of every word in the manuscripts they delivered to the press? Not likely. Musil, in particular, was known for making rigorous changes once he received pages from the printer. 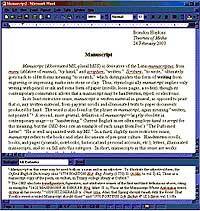 In all print media, manuscripts are altered by the processes necessary for putting them into print. They are revised by authors, corrected by copyeditors and proofreaders, molded by editors. Indeed, in the case of authors and editors, it is difficult to say where to draw the line of “authenticity.” In book publishing the author usually has the final say on creative choices while in print journalism the editor tends to have greater control. In either case, the manuscript’s relation to its final version may remain in constant flux. The difference between what is considered the manuscript of a book, for example, and its published version can be quite remarkable. 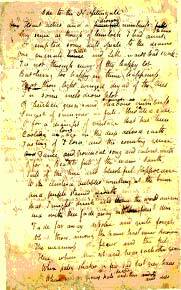 In some cases, a manuscript may bear little resemblance to the novel it gives rise to. Take for example Thomas Wolfe’s crates of manuscript for Of Time and the River compared to the final book–one tenth the size of the manuscript–as edited by Walter Perkins. Why do we sometimes assume the manuscript to be the reflection of the author’s intent and at other times regard the final version as “set in stone”? A modern manuscript often seems to us to be the individual and relatively unmediated expression of its author. [v] Yet we always wrestle with a contradiction between regarding a manuscript as “the genuine article” (next to which certain printed versions may be corruptions) and the final work as the authority (of which the manuscript was a mere prototype). In either case, the manuscript is to be gone back to, checked against the final, when we are studying a work. The attractiveness of the modern manuscript reflects the notion of the author as the basis of literary production in a way that pre-print society had not dreamed of. Moreover, the presumed dichotomy between manuscript and printed version obscures the reality that there are many forces involved in the production of a work. While an illuminated manuscript implies “uniqueness,” the modern sense of manuscript implies more than anything else “originality.” The former is the end of one type of production, the latter the beginning of another. Though the majority of pre-print manuscripts are copies of pre-existent texts, each strikes us as individual in some way. Each may be regarded as the work of one person or a group or simply as a discrete object of unknown provenance. Mass-produced books are not themselves seen as individual objects, yet their manuscripts are. [vi] The individuality of an illuminated manuscript is connected to the particulars of its presentation rather than the particulars of its content. That is, its unique use of pictures and script to mediate pre-existing material is what distinguishes this type of manuscript. In a modern manuscript, on the other hand, its unique content rather than its physical aspects is the distinguishing element. 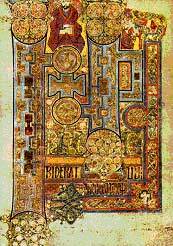 Also, a pre-print manuscript, e.g., The Book of Kells, seems to rely less on the figure of an author for its identity, while a modern one typically seems to have an intimate relation with its creator. The modern manuscript, especially since the Romantic era, has about it what Walter Benjamin calls an “aura“–a numinous quality of “authenticity.” The abovementioned Joyce manuscripts seem to reveal the workings of the author’s mind, taking us as it were behind the scenes of literary creation. Perhaps because it is marked as the beginning of a process of mechanical reproduction, we perceive the modern manuscript as carrying greater ontological weight than its copies. To do so, however, requires that we simplify the process of composition and reproduction–as the account of print history above also does–and reduce the actual complications involved to a more comprehensible model based on a smooth progression of causes and effects. Within this model, the manuscript is deemed valuable, no matter whether it truly reveals something new about a published work, adds to a list of contradictions, or creates an illusion of perfect artistic creation. The manuscripts of famous works fetch a pretty penny, as though we regard them as objects comparable to the ancient manuscripts of pre-print culture. Though manuscript always denotes a distinction between “writing” or “composition” and “print” or “final product,” there is yet another difference between manuscripts of pre-print culture and those of print or post-print culture. Since “writing” and “print” coexist in print and post-print culture, “composition” and “final product” have a relation that simply did not exist before the invention of the printing press. Thus our regard of manuscripts must necessarily be different from that of pre-print writers. Indeed this difference–especially as it relates to our conceptions of the “individual”–is one of the defining aspects of modern and post-modern culture. [iii] The fact that libraries regard even some typescripts as manuscripts is due to the residuum of authorial authenticity present in the handwritten changes he or she makes to it. The importance of the author in print culture is addressed below. [iv] The relatively modern practice of releasing revised editions adds yet another layer to this process. Publishers sometimes refer to a previous edition of a book used in producing the new one as “the manuscript.” However, this distinction is merely a practical one: though it confers manuscript status to a previously published work, it does so only for the convenience of naming the starting point of the reproduction process. [vi] Observing that they may be valued as highly as some manuscripts, one might argue that first edition or collector’s edition copies of certain books have a kind of individuality. Indeed, certain printed works (the Gutenberg Bibles, for example, since they have no discernable “manuscript” in the modern sense) seem to fall between or outside our distinction between manuscript and print. However, these objects tend to be valued for their scarcity or uniqueness, rather than their “originality.” Their value is thus comparable to that of pre-print manuscripts, and quite different from that of print-culture manuscripts. Benjamin, Walter. “The Work of Art in the Age of Mechanical Reproduction” in Illuminations. Trans. Harry Zohn. New York: Schocken Books, 1968 (pp. 217-251). Kittler, Friedrich A. Gramophone, Film, Typewriter. Trans. Geoffrey Winthrop-Young and Michael Wutz. Stanford: Stanford University Press, 1999. Oxford English Dictionary. Online edition.